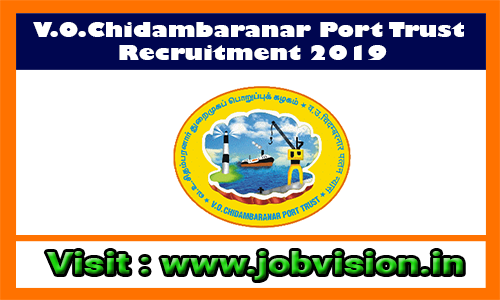 VOC Port Trust Recruitment 2019 - VOC Port Trust invites applications for recruitment of 72 Technician Apprentice, Graduate Apprentice, Trade Apprentice Posts. The applicants are requested to Download Application Form through Official Website www.vocport.gov.in. The last date for the receipt of application along with enclosures is 15.04.2019. Interested candidates are requested to peruse the advertisement regarding the process of Examinations and Interview, Eligibility Criteria, Application Fee, How to Apply, Pattern of Examination, Syllabus, Question Paper, Admit Date, Exam Date, Result Date etc,. Refer thoroughly before applying. VOC Port Trust may follow the following process to select the candidates. Interested candidates may send their applications addressed to the Chief Mechanical Engineer, V.O. Chidambaranar Port Trust, Tuticorin - 628 004 so as to reach on or before 15.04.2019 along with copies of certificates of educational, technical qualification, community in respect of SC/ST and Transfer certificate.